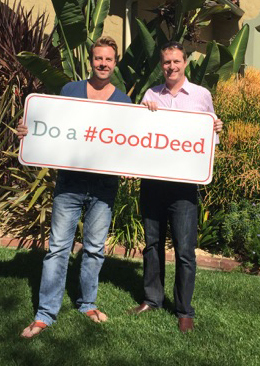 This past Sunday was International Good Deeds Day, an annual celebration of good deeds. The day is designed to demonstrate everyone has the ability, by performing good deeds, to improve the lives of others and positively change the world. This year more than 900,000 volunteers in 58 countries took part in official Good Deeds Day activities. And, millions more incorporated good deeds into their day. To mark the day, I supported DeedCarrier in its efforts to inspire people to get in on this global explosion of good. In doing so, I ended up being the one who was inspired. The amount of good being done, some of which was very creative, was simply beautiful. Of course, we don’t need to wait for an organized day to do good. In fact, we each have the ability, every day, to do something for someone else. It doesn’t need to be a grand act or part of an organized volunteer effort, in fact it’s often the little things that can have the greatest impact on both the recipient and the doer. Plus, doing good tends to be contagious, leading others to pay it forward.